The Herod who ordered the beheading of John the Baptist is Herod Antipas, one of the sons of Herod the Great. His first wife was from the neighboring Arabian kingdom of the Nabateans. I am sure you can visualize its capital city Petra cut into the cliff face in modern day Jordan because Indiana Jones went there to rescue the Holy Grail. While married to his first wife, Herod met Herodias, and they lived adulterously at first and then they both divorced their spouses so they could marry. Sin often brings its own punishment and it did in this case. 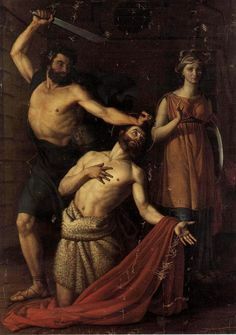 The Nabateans were enraged with Herod for slighting his first wife, one of their own, and in 39 AD there was open conflict between them which resulted in the exile of Herod. John the Baptist, following in the footsteps of the prophets of old who confronted the kings over immorality, confronted Herod the tetrarch. John the Baptist preached the truth about fidelity in marriage to Herod Antipas. Obviously John’s preaching to Herod was not successful; Herod and Herodias remained together. On this occasion, John the Baptist was like the prophets of old who enjoyed little success. Jeremiah, the prophet, despite all his pleadings would eventually see Jerusalem in the hands of the Babylonians because the people would not listen to his pleas to repent and return to living a life under the Covenant with God. The prophets were not called to be successful; rather they were called to preach the word of God whether welcome or not. John the Baptist preached to Herod without success, but John fulfilled his calling; he preached the word of God welcome or unwelcome. The hostility to his preaching on marriage means that just as he preceded Christ in his birth he would also precede Christ in his passion and death. Ultimately, the task of the priest is quite simply to be a voice for the word: “He must increase, but I must decrease”—the voice has no other purpose than to pass on the word…On this basis the stature and the humbleness of priestly service are both equally clear: the priest is, like John the Baptist, purely a forerunner, a servant of the Word. It is not he who matters, but the other.